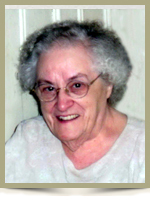 LIVELY – Mary Rosaline, 90, of Tantallon, passed away peacefully on Thursday, January 9, 2014 in Queens Manor, Liverpool. Born in Halifax, she was a daughter of the late William and Florence (Smith) Lacey. As a young woman, Mary worked at the Moirs Chocolate factory before returning home to raise her family as her children were the most important part of her life. In later years, Mary owned and operated the Glen Margaret Canteen and General Store on the Peggy’s Cove Road. Her dedication and love for her customers and the business all combined to make Mary a much respected business woman. No better fish and chips or hamburgers could be found! Mary closed her store to work at Nautel Electronics until she retired at age 65. Here, she made friends and was an inspiration with work ethic and kind deeds. Mary was always independent and never complained. It was with great dignity that she entered Queens Manor for the last years of her journey on this earth. To her, the staff became an extended family, and the Manor became her home. She especially enjoyed pub night and helping new residents feel welcomed. Mary is survived and greatly missed by her daughters; Sharon (Faread) Farrah, Seabright, Gail (Bernard) Hemeon, Milton, her son Philip, Halifax. Her sisters Millie McLeod, Lower Sackville, Shirley Falkenham, Woodville. Also mourning her passing are her grandchildren, great grandchildren and several nieces and nephews who meant so much to her as well as a very special friend, Anne Zwicker, who Mary always thought of as another daughter. She was predeceased by sisters Susan, Florence “Posie” , Gweneven and brothers Tom and Harold. The family would like to extend a special thank you to all the staff and volunteers at Queens Manor. Your loving care and kindness will never be forgotten. Also, thank you to Dr. Woodford for his kind and attentive approach over the last eight years. Gail and family, we are so sorry to hear of your mom’s passing. Please know that we are thinking of you at this difficult time. To Gail and family. Sorry to hear of your Mom’s passing. Our thoughts and sympathy are with you at this difficult time. To all of Mary’s Family: Our sincere sympathy on the loss of your mother. She was so friendly and would always stop to chat with us whenever we visited my Mom at the manor. She truly loved her children and always spoke so highly of you all. To Mary’s Family my deepest sympathy I knew Mary for three years and love her Beautiful smile. She was a quiet lady and was loved by everyone at Queens manor. My thoughts are with you. I can imagine the memories you must share because Mary shared so many with me. What a wonderful life she had with no regrets or complaints about how hard she worked. She was very fond of first Phoebe, then Willy and enjoyed giving them dog treats. Her face would light up when she smiled. She was not content to just pet the dogs, she would wrap her arm around their chests and give them a hug. The photos and cards and flowers in her room spoke of how much her family loved her and she loved them. Please know that the collective hearts of your extended family at South Queens Middle School are sharing in your grief at this time. So sorry to hear about your mom.Holding her memories close will help you get through this. Sorry to hear about “Mom”, Sharon….a good friend. Hi to the family. Gail and Family, I am so sorry to hear of your Mom,s Passing, My Mom Mildred and her were good friends at the Manor.my thoughts are with you. Sincere sympathy in the loss of your mother. gives you comfort during the difficult times ahead.